New US research has found that around 25 percent of Americans develop acute insomnia each year, even if they are usually good sleepers. 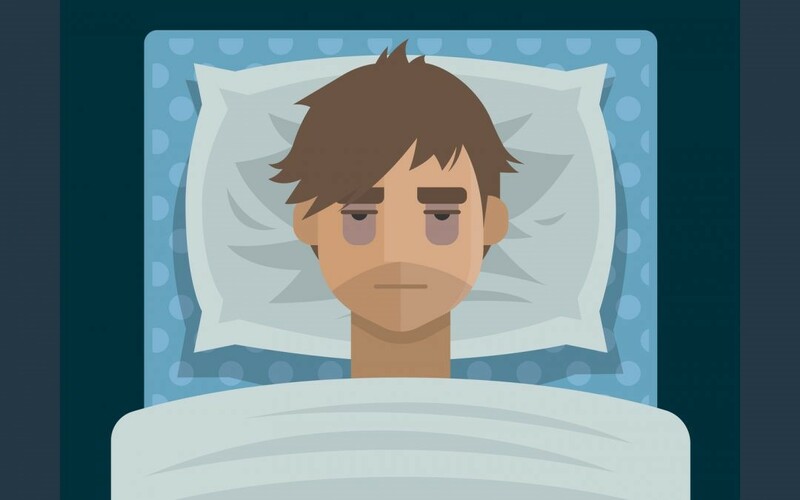 Carried out by researchers at the Perelman School of Medicine at the University of Pennsylvania, the new study recruited 1,435 adults across the United States and followed them for a period of one year to see how good sleepers may develop acute or even chronic insomnia. Participants were assessed on a daily, weekly and monthly basis and were also asked to keep a daily sleep diary. This enabled the researchers to gain a more detailed picture of how participants’ sleep varied from day to day. The participants’ daytime function, stress and life events as well as medical and mental health were also regularly assessed. Participants were all verified as being good sleepers over the first three months of the study — defined as those who need less than 15 minutes to fall asleep and/or who spend fewer than 15 minutes awake during the night on five or more nights per week. The researchers found however, that 25 percent of the participants went on to develop acute insomnia during the one-year study, which is characterized by difficulty falling asleep or staying asleep for as little as three nights per week for at least two consecutive weeks up to three months. The good news is around 75 percent of those who developed acute insomnia recovered good sleep within 12 months. However, 21 percent remained poor sleepers with recurring bouts of acute insomnia, and about 6 percent developed chronic insomnia. Insomnia changes from acute to chronic when it occurs at least three nights a week for more than three months. The findings could now form the basis for further research into what factors predict recovery (resilience) and non-recovery (persistent poor sleep or the new onset of chronic insomnia). Previous research from Perlis and his team has shown some of the serious consequences that insomnia may have, with the team finding that suicides are more likely to occur after midnight than during the daytime or evening, and that getting more sleep reduces suicide risk in those with insomnia. The findings were presented at SLEEP 2018, the 32nd Annual Meeting of the Associated Professional Sleep Societies LLC (APSS) taking place June 2-6 in Baltimore, USA. Since the results, “found no significant differences among different racial, ethnic, or gender groups, or among people of varying incomes or BMI,” this is a heavy hint that sleep troubles stem from nutrient deficiencies. Sleep aids aren’t the answer. Most sleep aid ingredients are designed to try and produce sleep forcefully by making you drowsy, and they don’t always get you to REM sleep. Optimal REM Sleep’s whole food ingredients are powerfully potent and delivered at the cellular level. They improve your sleep naturally and gently. Scientific studies show that the restorative power of the ingredients in the Optimal REM Sleep Formula are vital for Optimal Health. Yes, you do need to eat healthy whole foods, exercise and take your daily nutrients as well. And, while you are working on all of your health goals, you should focus on the easiest one that improves health: SLEEP! 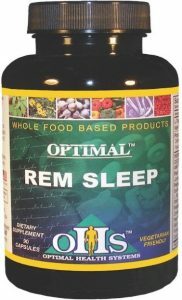 The potent ingredients in the Optimal REM Sleep Formula will help you get there. Tryptophan is an amino acid found in most proteins. It is the most research-proven and accepted nutrient to help calm the body. Tryptophan is used by the brain to balance serotonin levels that keep the body calm and to help maintain its ability to handle stress and anxiety. Tryptophan, as with all amino acids, is not absorbed well unless other protein co-factors are present. Both of these nutrients have great scientific research validating their ability to promote better sleep. The key to the Optimal REM Sleep formula is to make sure the synergistic benefits are best attained. So, we have blended Valerian Extract and Hops together to create a powerful combination that improves the amount of REM Sleep. A study out of Justus-Liebig University in Germany proved that even a single dose of a Valerian Extract/Hops combination increased the “time spent in sleep over a placebo formula.” Optimal REM Sleep Formula takes the German study a step further by adding the Valerian and Hops to the Cultured Media Blend; this increases the effectiveness even further. Used in herbal teas and formulations for centuries; its research shows it has a calming and natural sleep-promoting effect. Lemon Balm A perennial herb that research shows promotes a relaxed and calming state of mind which helps the body fall asleep faster. The predigested ingredients in REM Sleep shorten the time it takes to enter deep, restorative (REM) sleep and increases the time you stay there.